Nature has value, but what is that value and how do we protect it? Given competing interests and visions of the public good, how do we conserve our common resources such as land, water, and air? Participate in a thought-provoking discussion facilitated by Oregon Humanities. This is part of a Conversation Project hosted by Greenbelt Land Trust. Join us as we sit outside at beautiful Bald Hill Farm and explore our environmental values and question how those values are reflected—or not reflected—in current local, national, and global environmental policies. Special guests this evening will include local writers and philosophers, Kathleen Dean Moore and Michael Paul Nelson. For more info and to sign up, email rebecca@greenbeltlandtrust.org or call the GLT office at (541) 752.9609. With their Conversation Project, Oregon Humanities brings Oregonians together to talk—across differences, beliefs, and backgrounds—about important issues and ideas. The goal is to connect people to ideas and to each other, not to push an agenda or arrive at consensus. Conversation is a powerful medium to invite diverse perspectives, explore challenging questions, and strive for just communities. Facilitators are trained to connect their topic to the local community and to challenge participants to think in new ways. Monica Mueller is an instructor of philosophy at Portland State University and specializes in ethical and political philosophy. She published the book Contrary to Thoughtlessness: Rethinking Practical Wisdom and is interested in discussing the seemingly overwhelming problems of living together in a world with others. Conversation Project: What do we want from the WILD? Oregonians across the political spectrum place a high value on the diverse natural resources of our state, but we are divided about how these resources should be used and talked about. In this conversation, Oregon Humanities Executive Director Adam Davis will help participants step back from policy decisions and consider more basic questions about our relationship to the mountains, air, trees, animals, and streams around us. What do we want from nature? What do we understand nature to be, and how do we see ourselves fitting in? Join us for a local installment of Oregon Humanities intriguing ‘Conversation Project’ as we talk through what the wild means to us. 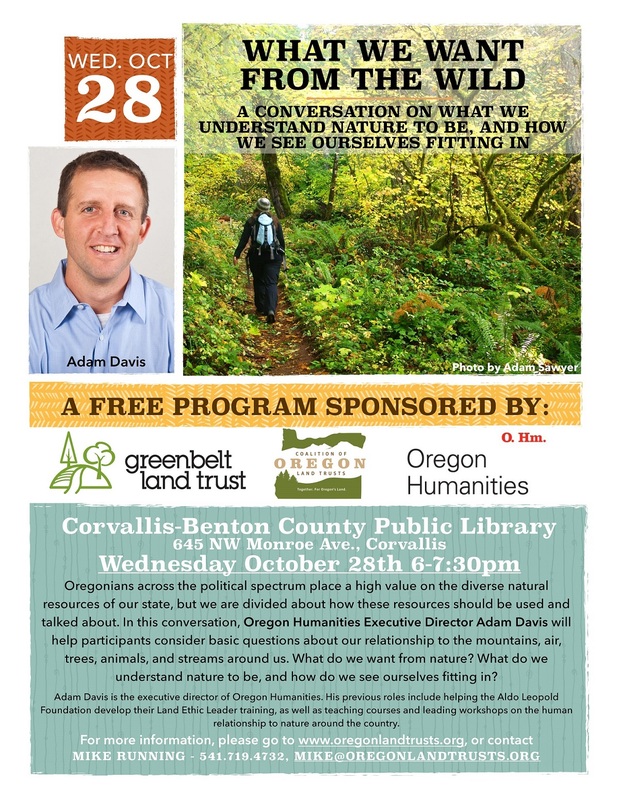 Cohosted by Oregon Humanities, Greenbelt Land Trust, and the Coalition of Oregon Land Trusts. Corvallis Library, Main Meeting Room.